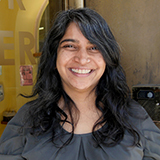 Saba Waheed is Research Director at the UCLA Labor Center. She has fifteen years of research experience developing projects with strong community participation. With her team at the UCLA Labor Center, she coordinated the first ever study of domestic work employers, launched a study of young people in the service economy, and conducted research on the taxi industry. She has also conducted research in other industries such as garment, nail salon, construction and restaurant industries. Previously she was Research Director at DataCenter, where she worked with community organizations around the country and conducted research on various issues such as housing, transportation, education, and non-profit sustainability. She also helped develop the framework of “research justice,” which aims to address the structural inequities in research. In addition to her research work, Saba is an award-winning radio producer and writer. She co-produces the radio show Re:Work, a storytelling show about work and Flip the Script on KPFK. She co-wrote and co-produced an animated film, I am a #youngworker. She also writes fiction. Saba strongly believes that research and media are powerful tools for community storytelling. She received an MA in Anthropology from Columbia University.